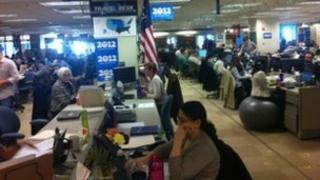 I've just been given a tour of Barack Obama's election headquarters in his home town of Chicago. Housed on the 6th floor of one of the city's many skyscrapers, it is an odd mix of nerd-cool and control freakery. The huge cluttered room feels like an open plan call centre staffed by the sort of people you'd expect to see working at an IT start up. Just about everyone is under 30. Everyone has a laptop in front of them and many are wearing outsized headphones. The ping-pong table at the back of the room adds to the mood of relaxed intensity that you get at many hi-tech companies. It doesn't get much use these days. Everyone is busy. The uniform long grey desks are littered with personal touches. There are enough water bottles, outsized to go cups, nachos and bananas to make them look like a contractual obligation. Some of the workers don't sit on chairs but instead perch on gigantic inflated silver beach balls. Among the desk decorations, the occasional conventional baby photo seems almost ridiculously un-ironic, amid other personal props like a horde of model dinosaurs riding motorcycles, cuddly toy gremlins with shocking pink fur and knobbly yellow stress balls. State flags still hanging from the low ceiling are a testament to ex-college kids' fervour during the recent "March Madness" of basketball season. Despite the cultivated kookiness, this is not an operation with a soft centre. It is a war machine, designed to crush Mr Obama's opposition. They have been planning all this for a long time. While his almost certain opponent, Mitt Romney, still isn't yet the officially adopted candidate, this operation has just celebrated its first birthday. On the wall is a notice, "Happy one year anniversary", listing the names of the 30 or so staffers who have been working here since last April. Their numbers have swelled every week and there are now around 300 of them. Add to that about 60 interns and 40 volunteers and you have 400 people with a single aim: to get Barack Obama elected to a second term. Although they are happy to let me see and film the room, getting information out of the team about what is actually going on is like squeezing blood from a peculiarly nervous stone. But it is clear they are here to deal with Mr Obama's overwhelming problem. 2012 is not 2008. The amazing coalition that propelled him to power hasn't exactly fractured, but the enthusiasm and energy has run away into the sand. Many natural Obama voters are disillusioned and demoralised. Even those who are pretty happy with the president hardly feel the same sense of exuberant excitement that they displayed in 2008. So this operation isn't really about making converts. It is about very precise targeting of likely supporters in key places, and giving them a jolt of energy to jump start the campaign. It is the job of the people in this war room to water and nurture the grass roots which sprang up so naturally four years ago. This is very much a digital campaign, using websites, e-mails and the apparent intimacy of Facebook and Twitter over big scale blanket advertising. Independent Democratic strategist Marilyn Katz says this will define the shape of the campaign. "Our task is to make sure people understand the stakes, are registered and organised to not only come out to vote but to get their neighbours to do so as well," Ms Katz says. "In 2008, the Obama campaign created a structure to which people self-organised and attached themselves." "This time around it is more professional. There's not that kind of grassroots groundswell, so the campaign has to recreate what occurred spontaneously in 2008." In the sprawl of the headquarters one area looks pretty much like any other, but they are not all the same. At the heart of it all are two projects: "Operation Vote" and "The Field Department". The first project targets groups of likely supporters with particular concerns and particular interest groups. Gay, lesbian and transgender. African-Americans. Hispanics. Single mums. "Greater Together" is aimed at college students, first time voters. There's even a "Chefs for Obama". The video department cranks out films designed to appeal to these groups. Most people will never see them. They don't go on TV, but are sent straight to supporters or put on YouTube. The Field Department is about geographical targets. It's divided into five regions: West, Midwest, North East, South and the Great Lakes. Republican strategist Chris Robling says he knows exactly what this is about. "They're focusing on the 13 swing states," Mr Robling says. "They are focused primarily on registration and being able to get their supporters to the polls." He says while the Romney campaign can't yet match Mr Obama's money or staff numbers or possibly ever match the big Chicago HQ, the campaign will catch up. "I think we are going to see a very close election and it will quickly ramp up. You are going to see thousands and thousands of volunteers and millions of dollars coming into the Romney campaign." But for now Mr Obama has the edge. Looking around his headquarters it is striking that you hardly see a phone, landline or mobile. But even when the workers get up to stretch their legs they take their laptop with them. This is very much a digital campaign. It is obvious that any political strategy these days is going to use social media, so much so that there is no need to belabour it. But there is something about the apparent intimacy of personally addressed e-mails, Facebook and Twitter that suits the aims of this particular campaign. "It is back to the future," Marilyn Katz says. "Grass roots, not broadcast media. Everything from knocking on doors to Twitter to Facebook. You have millions of young voters who don't get their news from TV but from social media and friends online and you have to penetrate each one of those venues." "In the same way, older voters may hear something on TV but are much more likely to vote depending on what their neighbours are doing," Ms Katz adds. "It's those intimate type of conversations, friendship networks, whether on the ground or on the web that get you out of your house into the voting booth." You often hear about the power of the incumbent and this room is one manifestation of it. Unlike Mr Romney, the Republicans' heir presumptive, Mr Obama hasn't had to concentrate on winning a messy internal fight. From the Chicago HQ tendrils flow down to every single state. By contrast, Mr Romney has closed offices in individual states after the primary contests, and has only a handful of people on the ground. Organisation isn't everything in politics. But it can be the difference between winning and losing. Mr Obama's team believe that if they can't have the natural wild magic of 2008, some clever stage craft and behind the scenes mechanics will still synthetically reproduce that winning wizardry in 2012.